Fight against the sinister Galactic Empire as a member of the Rebel Alliance. Engage in guerrilla warfare across the Star Wars galaxy as a solider, or gather critical intelligence as a cunning Rebel spy. Battle legions of stormtroopers, win new planets and their citizens to your cause, and stay on target in the fight against the ultimate power in the universe. No matter what role in the Rebellion you take, the fate of the galaxy rests in your hands. Age of Rebellion thrusts you directly into the ongoing Galactic Civil War between the evil Empire and the rag-tag Rebel Alliance. Woefully outnumbered and outgunned by the Empire’s vast military, you and your friends may undertake any of a wide variety of missions. No matter your duty, no matter your motivation, this is your chance to play your part in the cause for galactic freedom. Be a hero. Join the Rebellion! 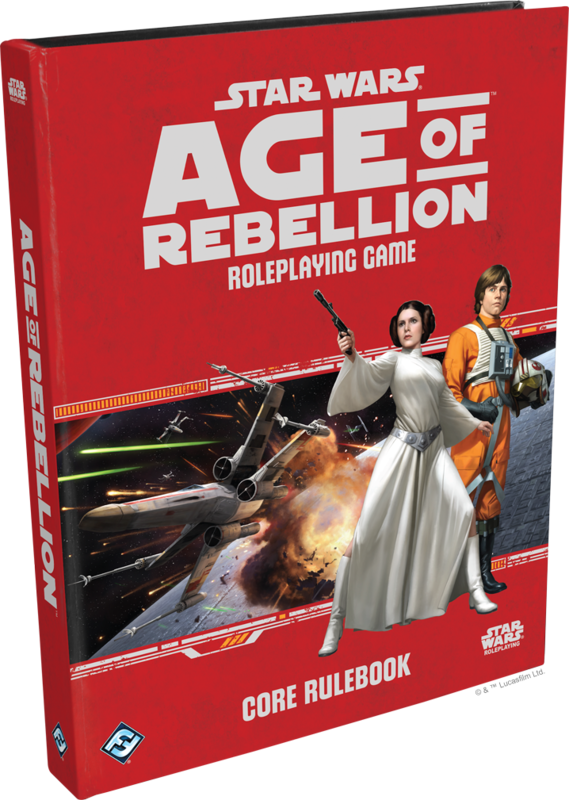 Age of Rebellion is the second of three standalone, fully cross-compatible roleplaying systems. 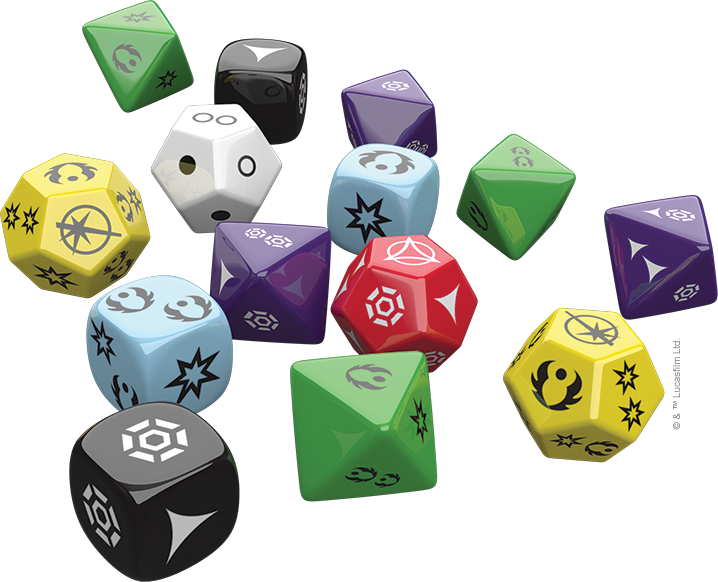 Each introduces a unique dimension of the Star Wars play experience, but all share the same custom dice mechanics. In Age of Rebellion, your success is vital to the Rebellion. It’s vital to the Rebellion’s next intelligence operation or military success, and it’s vital to the people you know and for whom you care. Your missions are matters of life or death. Your actions touch upon the fates of hundreds of planets and thousands of Rebels. This is war, and you must prevail, no matter the odds. In Age of Rebellion every character has a Duty, which is the specific role that character plays within the Rebellion and its cause. Your Duty is more than a story hook; it’s also one of the game’s core defining mechanics. It connects you to the Rebellion and to your stories. Whether you’re stealing restricted Imperial codes or bandaging the wounded, your duty grounds you in your adventures and lays the foundation for your advancement. 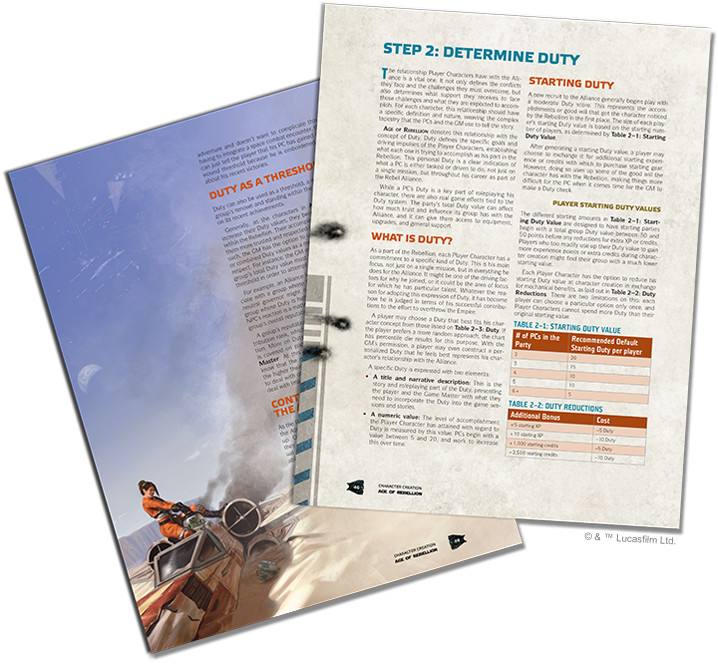 The more Duty points you receive, the more your character is recognized, and the more central you become to the Rebel Alliance and its efforts. As a member of the Rebel Alliance, you’re part of an outmatched, guerrilla resistance group fighting in a civil war that spans the galaxy. Your enemies are more numerous and better funded. Their tactics rely upon the overwhelming strength of their TIEs, troopers, and Star Destroyers, and they’re everywhere. To keep you in the action, and to ensure that every roll helps propel your story forward, Age of Rebellion makes use of a custom dice mechanic. Combining symbols for success and failure with symbols for “threat” and “advantage,” the game’s dice allow you to succeed at your actions, but still earn “threat,” or fail but still “advantages.” These results encourage stunning plot twists, and help translate the dramatic twists and turns of the Star Wars movies to your battles against the Empire! The galaxy needs heroes. Now you can become one.